LOVELY RUSTIC VILLA IN MONTUIRI, ready to accommodate up NINE ADULTS, PLUS ONE CHILD. The situation is just IN THE MIDDLE OF THE ISLAND. Therefore you will be able to reach anywhere by car in 30/50 minutes. This property is suitable for people who likes CYCLING. The bicycles will be also SAFELY STORED, and there are a lot of CYCLING ROUTES. The most EXCLUSIVE GOLF FIELD you can find in Mallorca is about 15 km away from the house. The villa consists in one building that has got 4 DOUBLE ROOMS (3 upstairs and 1 downstairs), ONE EXTRA BED for Children, and TWO EXTRA SOFA-BEDS for adults (downstairs). You will also enjoy a CHILL OUT AREA where you´ll find the SWIMMING POOL, two terraces in two different levels, sun beds, sun umbrellas, sofa, armchairs, tables, etc., to satisfy the most demanding and exclusive clients. We have just built a NEW BATHROOM, to make outside stay more confortable. In an ANCIENT MILL TOWER, close to the SWIMMING POOL, there is another EXTRA BED, but just for soft weather, because we don´t have air conditioning, neither central heating. Within the tower, there is a dishwasher and a fridge. The house it´s fully equipped with THREE COMPLETE BATHROOMS, kitchen, DINNING ROOM (up to 10 persons), and LIVING ROOM. Rooms and dinning/living room are equipped with AIR CONDITIONING. There is also CENTRAL HEATING throughout the house for the winter season. Outside you also have a SHELTERED TERRACE, big enough to accommodate the guests that can fit in this property. Nearly 250 SQUARE METERS built, a 10 X 5 METERS POOL, around 500 square meters of GARDENED AREA, plus 18.000 SQUARE METERS OF FARMING LAND makes this property a very beatiful choice. You will also enjoy a CHILL OUT AREA where you´ll find the SWIMMING POOL, two terraces in two different levels, sunbeds, umbrellas, sofa, armchairs, tables, etc., to satisfy the most demanding and exclusive clients. You also have a fridge for cold drinks, a diswasher, and an extra bed inside the tower to take the typical spanish "siesta". He have just built a NEW BATHROOM close to the pool to make outside stay more confortable. Nearly 250 SQUARE METERS built, a 10 X 5 METERS POOL, around 500 square meters of GARDENED AREA, plus 18.000 SQUARE METERS OF FARMING LAND makes this property a very beatiful choice. It was really nice to eat fruits of the day from the garden. The swimming pool is from 1,5m to 2,5m deep. My children loved it. Frank and family have been an easy going grup. All of them extremly polite and thougful. It has been really a pleasure to have them at home and wish to see again in their next vacation time. We have just returned from a wonderful holiday at Sa Sort Nova. From the moment we arrived Manuel was on hand offering assistance and information where required. The Villa itself is set on beautiful grounds with mature trees and flowers throughout the gardens and courtyard which is maintained regularly by the friendly gardener Benito! 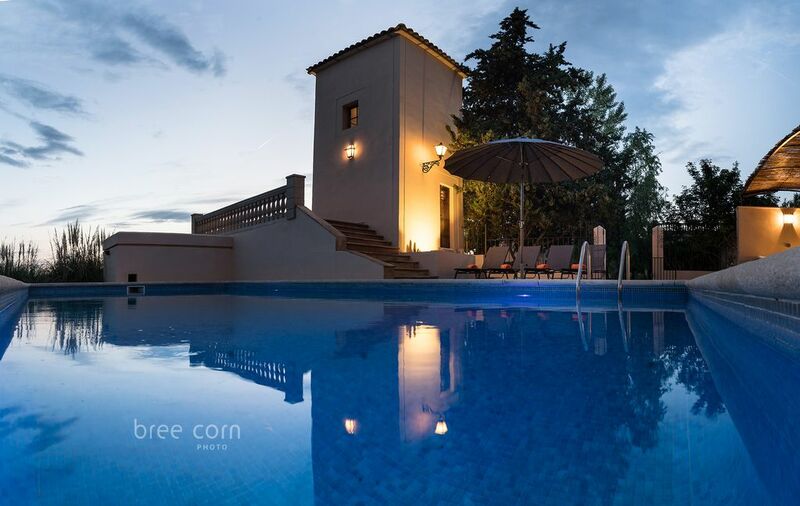 The Villa has kept its old style charm whilst still providing all the creature comforts required for a family holiday with comfortable beds, well appointed kitchen, lounge areas and bathrooms. Everthing was spotlessly clean up to 4star hotel standard. The "secret bedroom" in the ancient mill tower was a big hit with my 11 year old daughter! We had breakfast each morning in the lovely shaded courtyard area and used the charcoal barbeque on several evenings near the pool area. The pool area is so private with comfortable loungers , seating and out door dining area and the views over the surrounding countryside are beautiful. Added to this is the extra convenience of having an extra dishwasher and fridge freezer in this area to allow for cold drinks etc without having to return to the house. The new shower /toilet area at the pool is an excellent addition. Montuiri itself the local village has some traditional bars and restaurants which we visited and were made feel welcome and we experienced fantastic hospitality and great food! including Pamboli ! in S'Hostal . We had a hire car which enabled us to explore the beautiful island with Palma only about 25 mins away and most other resorts within 30/40 mins. We were particularly taken by Porto Cristo . In summing up ...we can't wait to return to Sa Sort Nova. We are a family of 5 with 3 children aged 7 to 13. Thanks for sharing with us your impressions after your stay in our property and also for your positive comments. I really appreciate. I am happy to know that you enjoy your Majorcan breakaway . Apart of that, I want to thank you again for your sweet comments on Benito. He´s a very hard worker and always go the extra mile to satisfy our guests. Wouldn't be the same without him and his wife! He is asking about you and your endearing family very often. I will be more than happy to receive you again in Montuiri whenever. The sooner, the better! Best regards for you and all your family, specially to Tom. Einfach genial! Wunderschöne gepflegte Finca in zentraler Lage, im mallorquinischen Stil, tolles Ambiente, mit beste Ausstattung. Freundlicher und hilfsbereiter Vermieter, der immer ansprechbar ist und uns mit guten Empfehlungen, sei es Restaurants oder Sehenswürdigkeiten einen unvergeßlichen Urlaub beschert hat. Vielen Dank! Wir kommen wieder!!! Lars and family are fantastic guests; all of them very thoughtful, careful and friendly. I would definitely recommend them to other hosts. Ein wunderschönes mallorquinisches Ambiente, man fühlt sich sofort zu Hause und herzlichst Willkommen. Das großzügige Haus mit 4 Schlafzimmern und 2 Bädern (3 Schlafzimmer 1 Bad 1. OG) bietet eine Oase der Ruhe. Alle Zimmer verfügen über eine Klimaanlage. Die Küche ist sehr gut ausgestattet (Geschirr, Besteck, Pfannen, Gläser etc.). Zusätzlich gibt es Geschirr, eine Kühl- Gefrierkombination und eine Spülmaschine im Turm am Pool. Der Pool liegt ca. 30 Meter vom Haupthaus, durch den liebevoll angelegten Garten, der durch einen sehr netten Gärtner gepflegt wird, getrennt. Der Vermieter ist sehr freundlich und hilfsbereit. Sollten Probleme auftreten, reagiert er sofort (z.B. Kaffeemaschine wurde sofort ersetzt). Man hat das Gefühl bei einem Freund zu sein. I am happy to know that you enjoyed your Majorcan breakaway . Apart of that, I want to thank you again for your sweet comments on Benito. He´s a very hard worker and always go the extra mile to satisfy our guests. Wouldn't be the same without him and his wife! They are endearing, lovely and easy going group; all of them very thoughtful, careful and friendly. Wir haben unseren schönsten Familienurlaub in diesem Haus verbracht! 3 Generationen unter einem Dach. Für jeden ist etwas dabei, genügend gemütliche Ecken zum Zusammensitzen, aber auch Rückzugsorte und viel viel Platz. Den Kindern hat das Turmzimmer gefallen, der Pool, der klosterähnliche Garten mit Palmen, Kakteen, Kräutern und Blumen. Uns Erwachsenen gefiel besonders die Terasse hinterm Turm für unsere Dinner, aber auch die Chillecke am Pool. Ein kleiner Orangenbaumgarten ist ebenfalls vorhanden. Im Innenhof kann man sehr viele Autos parken. Das Dörfchen Montuiri ist ganz nett mit einigen kleinen Restaurants, zum Strand Es Trenc ist es nicht mal eine halbe Stunde. Einkaufsmöglichkeiten gibt es im Dorf bzw. grössere Supermärkte in den umliegenden Dörfern wie Porreres. Das Haupthaus hat 4 Schlafzimmer, es ist ein sehr authentisches mallorquinisches Haus, sehr liebevoll eingrichtet. Schöne Zimmer (4) und Bäder. Der Vermieter hat uns sehr herzlich begrüsst, das Reningungspersonal und der Gärtner sind ebenfalls sehr liebe Leute. Die Strasse Ma-15 hört man, hat uns aber nicht gestört. Wir kommen wieder! Jana and family are fantastic guests; all of them very thoughtful, careful and friendly. They took care of the house as it was theirs. I would definitely recommend this endearing three generation Family to other hosts. Diese Finka muss man einfach gesehen haben! Wir waren von dem gesamten Objekt einfach begeistert. Sowohl das Haus, als auch die gesamte Außenanlage sind mit sehr viel Liebe zum Detail angelegt. Auch bei der Ausstattung hat es uns an nichts gefehlt. Im Gegenteil, wir haben uns ab der ersten Minute direkt wohlgefühlt. Auch die Lage ist perfekt wenn man ein Auto hat, da man innerhalb von 15 bis 25 Minuten an jeder Seite von der Insel sein kann. Durch ein paar Tipps des sehr freundlichen und engagierten Vermieters haben wir ein paar schöne Ecken von Mallorca kennengelernt. Wir kommen auf jeden Fall wieder. To tell the truth, I was a little bit worried because they were 8 people, and we like that our guests feel as confortable as possible at home, but it has been a large, endearing and easy going group. Maria was a wonderful lady and always had a beautiful smile on her face. All of them took care of the property as it was their own house. I would definitely recommend them to any other host. We are really happy that you enjoyed the stay at sort nova Villa and we´ll be pleased to have you back in your next vacation time. “BEATIFUL VILLA IN MONTUIRI, READY TO ACCOMMODATE UP SEVEN PERSONS PLUS ONE CHILD. THE BOUNDS OF THE PROPERTY ARE FENCED TO GUARANTEE CHILDREN´S SAFETY. THIS PROPERTY IS SUITABLE FOR PEOPLE WHO LIKES CYCLING. THE BICYCLES WILL BE ALSO SAFELY STORED. THE VILLA CONSISTS IN ONE BUILDING THAT HAS GOT 3 DOUBLE ROOMS (ALL OF THEM UPSTAIRS), AND TWO EXTRA BEDS FOR ADULTS (DOWNSTAIRS), AND ONE EXTRA BED FOR CHILDREN. IN AN ANCIENT MILL TOWER, CLOSE TO THE SWIMMING POOL, THERE IS AN EXTRA BED, BUT JUST FOR SOFT WEATHER, BECAUSE WE DON´T HAVE AIR CONDITIONING, NEITHER CENTRAL HEATING. THE HOUSE IT´S FULLY EQUIPPED WITH TWO COMPLETE BATHROOMS, KITCHEN, DINNING ROOM (UP TO 10 PERSONS), AND LIVING ROOM. TOWELS, SHEETS, BLANKETS, HOUSEHOLD ARE INCLUDED. CHIMNEY, BARBECUE, TVS WITH SATELLITE AND WIFFI AREA. YOU WILL ALSO ENJOY A CHILL OUT AREA WHERE YOU´LL FIND THE SWIMMING POOL, TWO TERRACES IN TWO DIFFERENT LEVELS, SUNBEDS, UMBRELLAS, SOFA, ARMCHAIRS, TABLES, ETC., TO SATISFY THE MOST DEMANDING AND EXCLUSIVE CLIENTS. NEARLY 230 SQUARE METERS BUILT, A 10 X 5 METERS POOL, AROUND 500 SQUARE METERS OF GARDENED AREA, PLUS 18.000 SQUARE METERS OF FARMING LAND MAKES THIS PROPERTY A VERY BEATIFUL CHOICE. SPECIAL PRICES FOR LONG WINTER RENTAL!!!! EVERYTHING IS AVAILABLE (MAIN BUILDING, ANCIENT TOWER, TERRACES IN TWO DIFFERENT LEVELS, SUNBEDS, UMBRELLAS, SOFA, ARMCHAIRS, TABLES, BARBECUE, WI-FI, TV, ETC, WITH THE ONLY EXCEPTION OF AN APARTMENT THAT IS ALSO IN THE PROPERTY (NOBODY WILL BE THERE DURING YOUR STAY). YOU´LL FIND AN EXCLUSIVE GOLF FIELD 15 KM AWAY FROM THE HOUSE. 1) From AIRPORT take LEVANTE MOTORWAY-0.6 KM- towards PALMA (MA-19). After about 2 km take MA-30. After about 2 km, at the first roundabout TAKE first exit right onto the motorway to MANACOR (MA-15). You´ll see a Traffic signal that indicates RANDA, LLUCHMAJOR, CURA (village is on the left). About 250 meters from Montuiri roundabout, you will pass by the right side of a bridge that crosses the highway. KEEP STRAIGHT ON approximately 200 meters. The Property is to the RIGHT. So, just passing the bridge, in FRONT OF YOU, you´ll see a big hedge, six or seven large palm trees, and a tower that is separate from the main building. DOOR IN A PLATE says "SA SORT NOVA"
From the Village roundabout to the property there are about 600 meters. 2) When you reach to Montuiri roundabout, turn to the LEFT, towards the village. Drive about 70 metres, and to the left, you´ll see a sport building, that indicates PABELLON ES REVOLT. I´ll be there waiting for you. CANCELATION POLICY FOR JUNE, JULY, AGOST, SEPTEMBER AND LONG RENTALS (14 or more days) THE RENT, FREELY AGREED BY BOTH PARTIES, IS SET AT THE SUM OF…….. THAT WILL BE PAID BY THE LESSEE TO THE LESSOR IN THE FOLLOWING MANNER: 1) FIRST PAYMENT: AT THIS MOMENT, 50% OF THE TOTAL AMOUNT AS A DEPOSIT TO BOOK THE PROPERTY. 2) SECOND PAYMENT: THE OUTSTANDING 50% WILL BE DUE 2 MONTHS PRIOR TO THE ARRIVAL DATE. IN THE CASE OF THE LESSEE DECIDING TO RESCIND THE AGREEMENT BEFORE THE DATE OF THE COMPLETION HEREOF, HE WILL NOTIFY THE LESSOR OF THIS IN WRITING, WITH A REQUEST SENT TO THE ELECTRONIC MAIL TO THE ELECTRONIC MAIL ADDRESS MANUEL1430@GMAIL.COM BEING VALID, AS LONG AS SAID RECEIPT HAS BEEN CONFIRMED BY THE SAME CHANNEL BY THE LESSOR. IF THE NOTICE HAS BEEN MADE AT LEAST 2 MONTHS IN ADVANCE OF THE ARRIVAL DATE, THE LESSOR WILL REIMBURSE 50% OF THE DEPOSIT, KEEPING THE OTHER 50% AS A PENALTY. IF THE NOTICE HAS BEEN MADE LATER THAN 2 MONTHS IN ADVANCE OF THE ARRIVAL DATE, THE LESSOR WILL RETAIN THE COMPLETE DEPOSIT AS A PENALTY. In Case the Lessee doesn´t make the second Payment, the lessor will communicate this fact to the lessee throughout the website, in order to make it in the next 72 hours. In case this payment is not made, the lessor will retain the first payment, and will be authorised to rent the property to any other guest. IF THE LESSOR IS OBLIGED TO HAVE TO CHANGE THE LESSEE OF THE PROPERTY, IT WILL REIMBURSE THE ENTIRETY OF THE SUMS PAID, WITHOUT THE LESSEE BEING ABLE TO MAKE A CLAIM FOR ANY OTHER REASON FOR THIS FACT. THE LESSOR WILL HELP THE LEESE AS MUCH AS POSIBLE TO FIND ANOTHER ALTERNATIVE FOR HIS STAY IN MALLORCA CANCELATION POLICY FOR THE REST OF THE YEAR (except long rentals) IF THE NOTICE HAS BEEN MADE AT LEAST 60 DAYS IN ADVANCE OF THE ARRIVAL DATE, THE LESSOR WILL REIMBURSE THE ENTIRETY OF THE SUMS PAID IF THE NOTICE HAS BEEN MADE LATER THAN 60 DAYS IN ADVANCE OF THE ARRIVAL DATE, THE LESSOR WILL RETAIN 50% OF THE DEPOSIT AS A PENALTY.